04 - Natural Selection 04-11 - Divergence of Character 260 We have seen that in each country it is the species belonging to the larger genera which oftenest present varieties or incipient species. 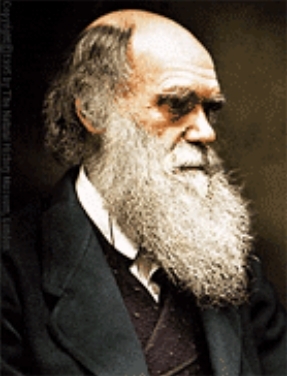 This, indeed, might have been expected; for, as natural selection acts through one form having some advantage over other forms in the struggle for existence, it will chiefly act on those which already have some advantage; and the largeness of any group shows that its species have inherited from a common ancestor some advantage in common. Hence, the struggle for the production of new and modified descendants will mainly lie between the larger groups which are all trying to increase in number. One large group will slowly conquer another large group, reduce its numbers, and thus lessen its chance of further variation and improvement. Within the same large group, the later and more highly perfected sub-groups, from branching out and seizing on many new places in the polity of Nature, will constantly tend to supplant and destroy the earlier and less improved sub-groups. Small and broken groups and sub-groups will finally disappear. Looking to the future, we can predict that the groups of organic beings which are now large and triumphant, and which are least broken up, that is, which have as yet suffered least extinction, will, for a long period, continue to increase. But which groups will ultimately prevail, no man can predict; for we know that many groups formerly most extensively developed, have now become extinct. Looking still more remotely to the future, we may predict that, owing to the continued and steady increase of the larger groups, a multitude of smaller groups will become utterly extinct, and leave no modified descendants; and consequently that, of the species living at any one period, extremely few will transmit descendants to a remote futurity. I shall have to return to this subject in the chapter on Classification, but I may add that as, according to this view, extremely few of the more ancient species have transmitted descendants to the present day, and, as all the descendants of the same species form a class, we can understand how it is that there exist so few classes in each main division of the animal and vegetable kingdoms. Although few of the most ancient species have left modified descendants' yet, at remote geological periods, the earth may have been almost as well peopled with species of many genera, families, orders, and classes, as at the present time. 04 - Natural Selection 04-11 - Divergence of Character 250 I see no reason to limit the process of modification, as now explained, to the formation of genera alone. 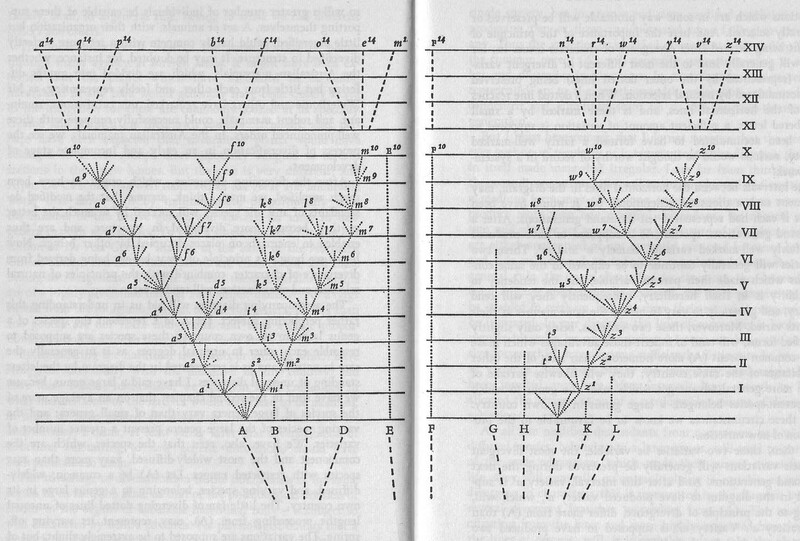 If, in the diagram, we suppose the amount of change, represented by each successive group of diverging lines to be great, the forms marked a14 to p14, those marked b14 and f14, and those marked o14 to m14, will form three very distinct genera. We shall also have two very distinct genera descended from (I), differing widely from the descendants of (A). These two groups of genera will thus form two distinct families, or orders, according to the amount of divergent modification supposed to be represented in the diagram. And the two new families, or orders, are descended from two species of the original genus, and these are supposed to be descended from some still more ancient and unknown form. 04 - Natural Selection 04-11 - Divergence of Character 230 It is worth while to reflect for a moment on the character of the new species F14, which is supposed not to have diverged much in character, but to have retained the form of (F), either unaltered or altered only in a slight degree. In this case, its affinities to the other fourteen new species will be of a curious and circuitous nature. Being descended from a form which stood between the parent-species (A) and (I), now supposed to be extinct and unknown, it will be in some degree intermediate in character between the two groups descended from these two species. But as these two groups have gone on diverging in character from the type of their parents, the new species (F14) will not be directly intermediate between them, but rather between types of the two groups; and every naturalist will be able to call such cases before his mind.